When Giancarlo Stanton got to the big leagues in 2010, he became the modern-day symbol of the hulking slugger. At 6-foot-6 and 245 pounds, he’s a gigantic human being, and he’s used that strength to hit the baseball like no one else. When he did hit the baseball, anyway. As part of the natural trade-off for his legendary power, Stanton also ran top-of-the-scale strikeout rates. From his debut through 2016, he struck out in 29% of his plate appearances, ranking behind only Chris Davis, Pedro Alvarez, and Mark Reynolds among regulars during that stretch. The fact that he ranked behind only Jose Bautista in ISO allowed him to remain productive even with the strikeouts, and combined with a lot of walks and regularly high BABIPs, Stanton’s 141 wRC+ from 2010-2016 ranks 7th best in baseball. Stanton was a living example of the ability for elite power to offset contact problems. But then, last year, that delicate balance seemed to break down. For about a month beginning in mid-May, Stanton struck out in 37 of 80 plate appearances, managing just one home run in the process. He hit .114/.215/.200 during that stretch, and people started openly wondering what happened to the game’s preeminent slugger. Had Stanton’s contact issues finally become too severe? Had the league finally figured him out? Well, if pitchers had made an adjustment to neutralize the game’s most devastating ball-striker, Stanton apparently decided to adjust himself. And since that miserable month of flailing at everything, he’s become a pretty different hitter than he’d been previously. Before last May’s crater, Stanton’s rolling 30 day average Contact% was generally between 65%-75%. At his nadir last June, that bottomed out at 58%, the worst stretch of contact-making in his career. But as Stanton adjusted to cut down on the strikeouts, he’s gone straight from career-worst to career-best, maintaining a 30-day average better than his career norms ever since, and topping out at 77% back in April. This is a version of Giancarlo Stanton we’ve never seen before. And as you’d expect, the increase in contact has led directly to a cut in strikeouts. 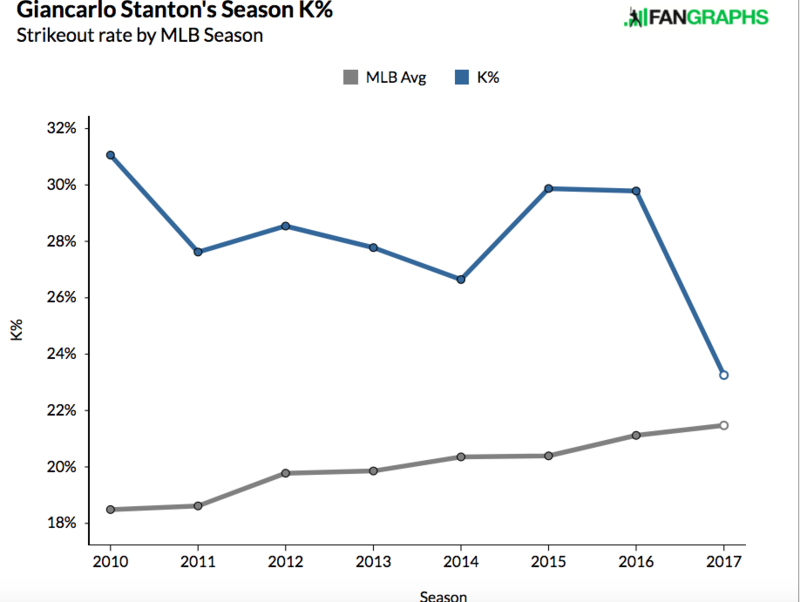 Despite another tick up in league strikeout rate this year, Stanton’s posting the lowest K% of his career, at just 23.3%. And it’s not just a two-month fluke, as he ran a 25% K% from mid-June through the end of last season, after his disastrous month concluded. If you go back to June 15th of 2016 (the end of his 37-Ks-in-80-PAs stretch), he’s run just a 24% strikeout rate in 456 PAs. He’s never posted a strikeout rate below 27% in any season of his career, and that’s coming up on nearly a full season’s worth of plate appearances. While the league is striking out even more often, Stanton is striking out less and less. Of course, to make more contact, one generally has to give up some power. And while Stanton’s still hitting plenty of home runs, he apparently has decided to do just that. A couple of years ago, Stanton was the king of Statcast, but this year, his numbers are relatively human. While he ranked at the top of basically every Exit Velocity leaderboard you could think of in 2015, he’s just 21st in average EV this year. Max Kepler is hitting the ball harder, on average, than Giancarlo Stanton. This isn’t what we’re used to. But one of the interesting things about the Statcast data is how much of offensive performance isn’t captured by simply hitting the ball as hard as possible. Mike Trout, the best hitter alive, has an average EV of 89.1 mph, pretty much in line with the league average. Joey Votto is at 88 mph. So is Daniel Murphy. There definitely are great hitters who hit the crap out of the ball, but there are better hitters who don’t hit the ball as hard, but hit it far more often. Stanton, it appears, has decided to become more like those guys. 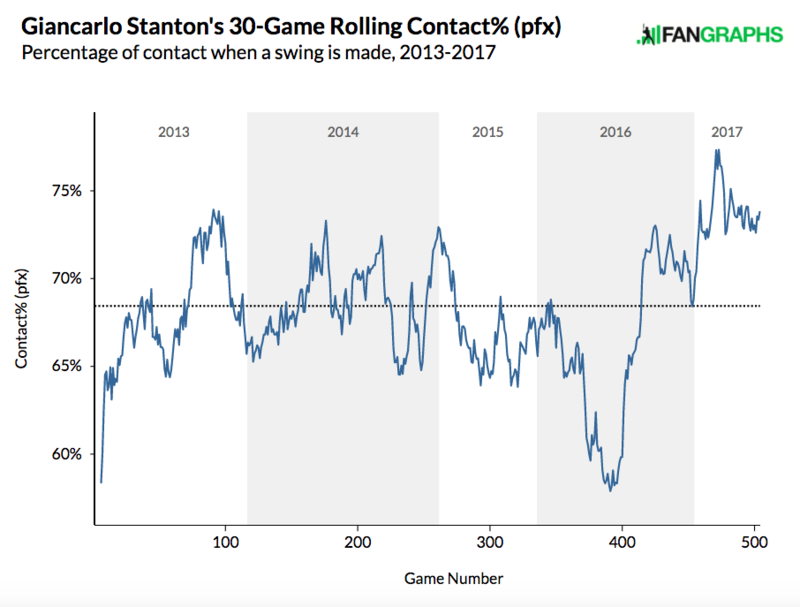 As his contact rate has climbed, Stanton’s doing less damage on contact than he used to be, and perhaps not surprisingly, is now seeing more strikes thrown his way. These are all shifts more than total revolutions, as he’s still a power hitter who does a lot of damage when he hits the ball, but he’s now moved more towards the normal levels of contact and production, rather than being an outlier on both ends. Giancarlo Stanton has arrived at a career crossroads. He remains the game’s premier baseball destroyer, though his 2016 Adjusted Fly Ball Contact Score of 220 is down a bit off of career highs. He crushes all BIP types and hits a ton of fly balls: all should be A-OK with regard to contact quality, right? Well, whiffing as much as he does (and his trend is up sharply in that category), he needs a 164 overall Adjusted Contact Score to merely rank as a reasonably well above-average offensive right fielder. Stanton has (a) never posted a league-average liner rate; (b) is flirting with extreme grounder-puller status, which would deal his already tenuous batting average a body blow; and (c) sees both his K and BB rates spinning in the wrong directions. Throw in the possibility that he may now truly be injury prone, and there’s a ton of risk here. Mike Trout had some negative markers on his profile a couple years back; he dealt with them. Stanton must do the same, or his contract size and length could soon become an issue. It seems that Stanton got the memo. The version we’ve seen since last summer isn’t the same as the guy we saw in prior years. He’s seemingly traded awe-inspiring moonshots for an uptick in contact, and while it hasn’t resulted in a more productive player overall, he’s at least gotten back to a high level of production after last May’s disaster month. Maybe this change is more about staving off decline than finding a new level of production, but as Tony said, Stanton looked to be at a crossroads, and for now at least, he’s chosen to take the path less traveled. We hoped you liked reading Giancarlo Stanton Is Changing by Dave Cameron! The very definition of overrated. Read the article before you comment. Maybe the problem lies with the raters, not the one who is being rated. A hitter 35 percent better than league average (and 41 percent for his career), seems, I don’t know, pretty good. The very definition of a terrible commenter. I wouldn’t go that far, that seems a lil’ harsh … How about the very definition of a terrible comment?